Christians have been teaching a form of teamwork for a long time. The Apostle Paul referred to the followers of Jesus as the Body of Christ because like the human body it was made up of members with different abilities and functions, but all working together like the teams we have today. However, Christian teamwork has never been as efficient as it could be because members usually do not think of themselves as a team. The word “team” has come to mean a group of people, each with different skills and backgrounds, working together in a well coordinated effort toward a well understood goal. Until recent decades Christians have not paid much attention to how well their efforts were coordinated or whether everyone clearly understood the goal. They were simply being asked to be servants of God volunteering for tasks when they had the time. The decline of membership and attendance at worship services in many parishes or congregations is an indication that it may be time for Christians to become aware of the need to incorporate team-based ministry into their effort. Team-based ministry is important because it reduces pastor burn out and enhances loyalty and efficiency in congregations. The books listed below are helpful for understanding the benefits of team-based ministry. Philip Van Auken, author of Managing Ministry in Christian Organizations: A Team Approach published in 1989. Philip Van Auken is a professor of business administration at Baylor University and an active Christian layperson. George Cladis, author of Leading the Team-Based Church published in 1999. George Cladis is Executive Pastor at Liberty Church, a multi-site church in the metro Boston area and the chief executive officer of New England Dream Center, a faith-based social service agency. John C. Maxwell, author of The 17 Indisputable Laws of Teamwork in 2001. John C. Maxwell has become well know as a motivational speaker and consultant on leadership. Wayne Cordeiro, author of Doing Church as a Team published in 2004. Wayne Cordeiro is the founding pastor of New Hope Christian Fellowship in Honolulu, Hawaii which has over 14,500 in weekend attendance at their many sites. E. Stanley Ott author of Transform Your Church With Ministry Teams published in 2004. E. Stanley Ott is a Presbyterian pastor and president of the Vital Churches Institute in Pittsburgh, PA.
Jim Putman, author of Church as a Team Sport published in 2008. Jim Putman is a pastor at Real Life Ministries in Post Falls, ID and a former wrestling coach. 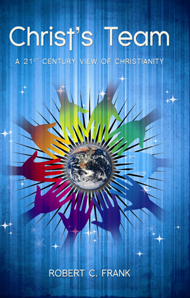 My own book, Christ’s Team: A 21st Century View of Christianity, published in 2009, portrays Christianity as a team effort in continuing creation and includes the role of science. I'm a physicist and Lutheran lay person who introduced team-based ministry in the congregation in which I am a member when I was president over ten years ago. Dale Roach, author of The Jethro Ministry, a book about Christian teamwork and published in 2014, has been publishing his writing and that of others on his www.likeateam.com web site for quite some time. It has become an exceptional resource for leadership and teamwork development. Dale Roach is the Senior Pastor at Poplar Springs Baptist Church in Moore, South Carolina. Most of the authors listed above do consulting work with congregations interested in team-based ministry.